In 1980, the company began operations in a modest building in Granby, Quebec. Thirty years later, Artopex has become a major manufacturing company due to the remarkable growth it experienced from the start. 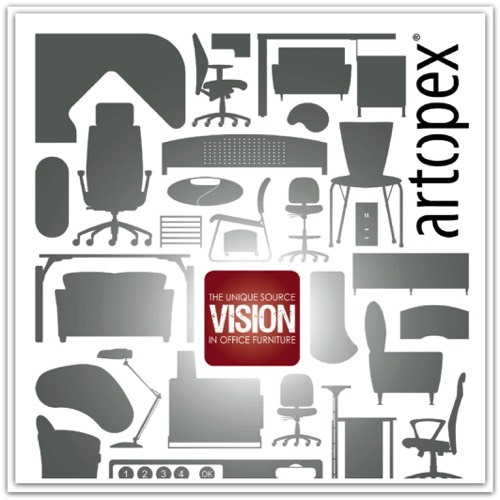 Artopex offers customers a complete range of office furniture that is both functional and aesthetically pleasing. Their products and their approach are known and appreciated by our vast clientele, which extends throughout North America. Artopex began with a family and remains rooted there with Daniel Pelletier, President and Founder at the helm, in collaboration with his brothers, André and Maurice, now retired. Supported by its solid foundation, Artopex has experienced consistent remarkable growth in North America since its inception. Key to this growth are their dedicated employees and valued partners who have played an important role in the evolution and advancement of the company. Artopex has always remained very committed to its associated distributors.The sales team’s enthusiasm paired with the business development team’s efficiency makes for a winning combination. From the plant floor to the customer service department, their employees work to ensure the satisfaction of each and every client. Artopex is proud to be 100% Canadian owned and operated with all of its manufacturing facilities in its home province of Quebec. Some of the Artopex factories are certified ISO 9001:2008, ISO 14001:2004 and C-TPAT accredited (Customs Trade Partnership Against Terrorism). The remaining are in the process. 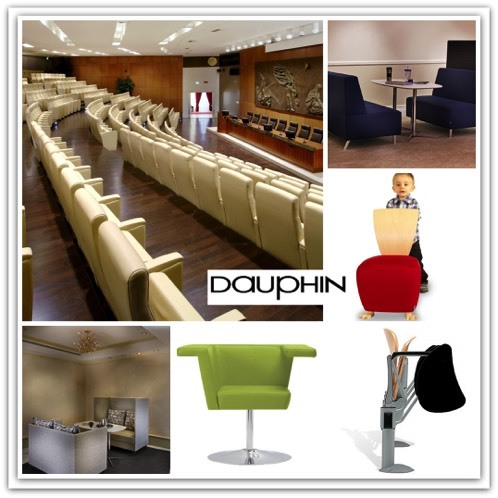 Dauphin is one of the world's leading office seating manufacturers, recognized in more than 50 countries for our proven competence in the field. Since our founding in 1969, Dauphin has pursued a commitment to healthy posture and has invested in extensive R&D in the areas of health and design to expand our product portfolio to meet your changing needs. Products which embody the concept of health and safety in the office, plus creative marketing of this principle have been key to our success, and the engine behind our growth to a $200-million enterprise which produces more than 4,000 units a day and serves the NAFTA markets from our factory located in New Jersey. Active involvement by the company's founding family in all aspects of the company's operation and adaptability to local market demands will continue to propel the growth of this innovative enterprise. Our highly prized ISO-9001 and ISO-14001 certificates evidence recognition of Dauphin's product and service quality. Today, Dauphin is known as a leading provider of adaptive furniture solutions that enable people to thrive and connect in today's interactive environments. From individual seating and tables, to lounge and installed seating, Dauphin delivers innovative furnishings for your dynamic spaces. We take great pride in the many awards and testimonials that our products and organization has garnered over the years, including our environmental policies that we have developed and promoted for many years. We believe that our reliable and innovative products backed by our exceptional service and customer satisfaction policies will sustain our growth with the continued support of you, our valued customer. We are particularly pleased to be certified and registered as an I.S.O. 9001:2008 Company and Greenguard approved. Furthermore, all of our products are also certified under the more stringent Greenguard Children and Schools standards. Our commitment to operational excellence is a reflection of our strongly held values and Nightingale's history of innovation. Our customers' needs are not confined to the work environment alone, but focus also on the processes that support their design, specification, manufacturing, delivery, installation and ongoing service. They're concerned with the reliabiity of every aspect of their relationship with Nightingale. To address these concerns, we continually apply, and even pioneer, innovative practices and technologies to our operations network, from the dealer, through our manufacturing, and to our vendors. Valo, is a leading provider of quality value office furnishings that are attractive in styling, designed for durability and ease of use, and are available for quick delivery. 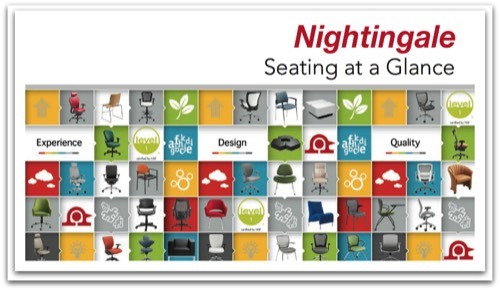 This high-energy company provides consultative furniture solutions for Dynamic Spaces that identify emerging trends, innovate green environments, and inspire collaboration and connection. Well-designed dynamic spaces, furnished with Valo product will enable you to offer solutions for optimizing motivating work environments to foster creativity, enable collaboration, improve productivity, promote innovation, reduce costs and retain talent. Valo = Value and offers a product line that includes ergonomically designed or inspired seating and the konstrux table system, which received a best of NeoCon Silver Award. 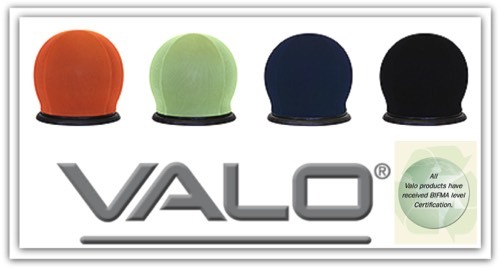 From mechanism, frame and aesthetics to delivery, customer service and warranty, Valo delivers!